Angela's Accessories: A Big THANK YOU! We have been blessed to be featured on two sites! Check them out here and here. Thank you so much for showing our bows off to your friends, family and fellow blog readers. The hair style that featured the circle bow at girlydos.blogspot.com was so fun and funky, we might all have girls walking around town with this very same hair do. Thank you so much! We really appreciate your willingness to feature our circle bow on your blog. And if you ever want your little girl to have a cute "do" just click your way over to girlydos.blogspot.com. Another great site for your princesses hair do's is hair4myprincess.blogspot.com. Her blog is filled with unique hair do's fit for a princess. They are definitely original and way cute! Thank you so much for featuring our clips on your blog! We cannot thank you enough, and we are just so excited to see our clips on your beautiful princess. 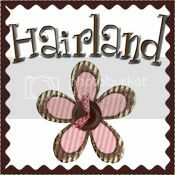 For another great site for girl's hair do's, go right over to hair4myprincess.blogspot.com.